The door prizes at the June meeting of the Wayne County Gem and Mineral Club consisted of a bucket of miscellaneous unpolished slabs from the club collection. Linda Schmidtgall had scoured the club collection and accumulated a wide variety of colorful and unique pieces. She set them in water for folks to make their selection. When my number was called I picked out a unique volcanic rock slab. It was an end cut, which meant one surface was raw. I broke it into three pieces and polished the smaller one the following day at the workshop. The upper two pieces have rough natural surfaces. As many know, I collect interesting rocks which tell a geologic story, with a bias towards so-called “hard rocks”, both igneous and metamorphic. Fortunately I already knew a bit about this rock. On the joint WCGMC-NPGS summer trip to Thunder Bay in 2016 we met a couple from British Columbia. They had collected similar rock in their home province and they traded pieces with each of us (see photo in next column). But all I truly knew was that the unique porphyritic rock came from Vancouver Island, British Columbia and that it had been collected on a beach. Slab acquired in trade during the summer of 2016 from British Columbia collectors. Now with multiple samples I wanted to know more. Could I learn the composition of the groundmass to name the rock properly? What age was it? 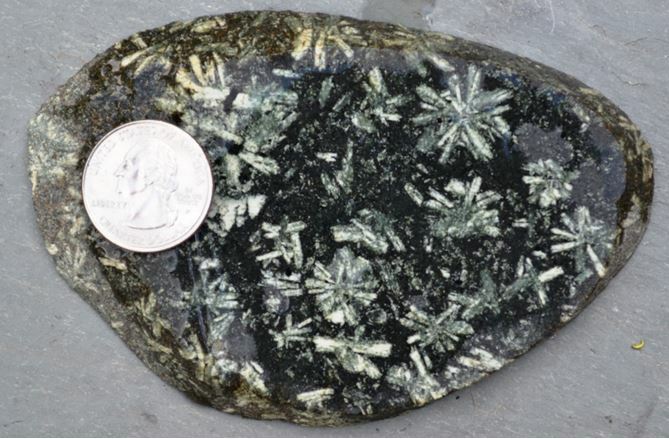 How did the unique snowflake or flower character of the feldspar phenocrysts originate. Naturally, I turned my computer on and began to investigate. Turns out it was not that simple. I found the rock variously labeled as porphyritic gabbro and basalt porphyry. OK, which is most appropriate? Is this best classified as an extrusive or intrusive rock? 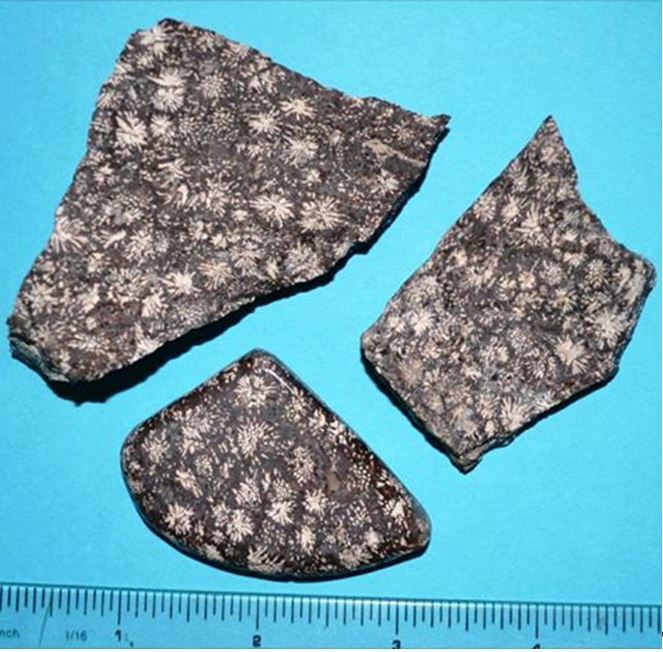 The groundmass is quite fine grained, but one can see other crystals besides the flowery feldspars. Furthermore, Vancouver Island has a complex geology and there are at least two ages of volcanism that produced dark volcanic rock, Devonian and Triassic. The technical papers on the various rocks did not seem to include a description of the phenocrysts; the lapidary/rock hound references referred to the rock affectionately as “flowerstone”, but contained insufficient geologic input. 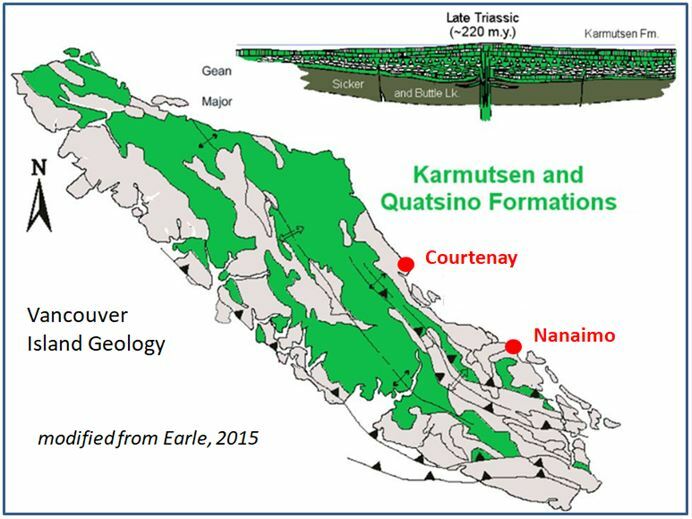 Geologic map of Vancouver Island showing the extent of the Triassic Karmutsen Fm. I also learned that “flowerstone” can be collected on the beaches between Nanaimo and Courtenay on the east side of the island (Burnett, 2015) and there are other smaller islands in Vancouver Sound where it has been found. However, Vancouver Island is 2900 miles via US roads (or 4700 km across Canada!) from Rochester, New York. I’ve decided that is a bit too far for a field trip so I am very happy to have acquired my specimens from a collector and from the club. And now I am equally happy to be able to label them properly! 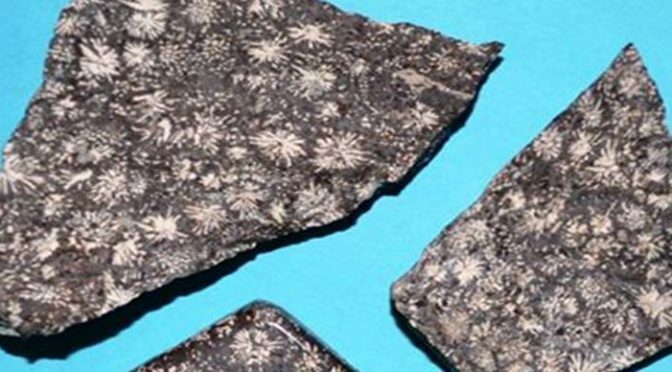 Note: Although so-called “chrysanthemum” stone from China appears similar it has a sedimentary origin and is both mineralogically and geologically distinct from British Columbia basalt porphyry. My name is Isabelle Prenat, I have lived in Victoria on Vancouver Island since 1988. I thought I would describe my flowerstones collection to you. I walk the beaches all the time and have collected “Flowerstones” since almost day one! As well as tons of other rocks, including lava. I now have a large collection. Most are black, green or grey with always white “flowers” and I once found an unusual light brown rock. The flowers sizes on my rocks range from tiny, around 1/8 of an inch across to quite large, 3/4 or maybe close to an inch across. Usually, the flowers on each rock are all pretty close in size. I have not really seen a wide range of sizes on one rock. Most of the flowers are often evenly spread out on the rocks, but some rocks have clusters separated by areas empty of crystal, these are somewhat rare. The flowers are sometimes interspersed with straight lines and dashes of crystals or , sometimes, the crystals do not form a complete flower. My biggest rock is quite heavy, somewhat oval, green and about 8 by 6 inches. It weighed a proverbial ton to me and was hard to bring back to my vehicle. The flowers on this rock are about 1/2 inch across and protrude from the rest of the rock surface, which is smooth, suggesting to me that the crystals are harder than the rest of the rock’s material. Many of my rocks are completely smooth, likely from the ocean waves smoothing them out. I have found some flowerstone rocks on river beaches. And, the rare brown one I mentioned above was no where near a beach, it was in a field. It is smooth, so it may have been brought by humans from a beach or gravel pit, I just don’t know. Well, I hope this gives you a little more anecdotal info on these very pretty rocks! By the way, I can usually find at least one on every beach hike I go on. Hope you are enjoying Quartzite. Some year I am going to need to get out there. I spent 5 years in Arizona as a graduate student in geology in Tucson and then as an exploration geologist living in Kingman. I got hooked on rocks and minerals while there. Now retired in the northeast it would be a long haul and I suspect many of the places I used to hunt are close now. But just the same I should make a trek some January/February. At the very least I would escape winter for a while.